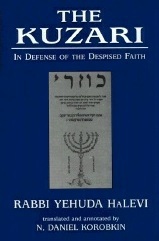 544 pages, 6" x 9" size, published March 1998 by Jason Aronson Inc.
"The Kuzari: In Defense of the Despised Faith" is the first new translation into English of The Kuzari since 1905, annotated and explained based on the classic commentaries. Written by Rabbi Yehuda HaLevi of Spain over a period of twenty years and completed in 1140, The Kuzari has enthralled generations of Jews and non-Jews alike with its clear-cut presentation on Judaism, and its polemics against Greek philosophy, Christianity, Islam, and Karaism. The Kuzari presents a dialog between King Bulan of the Khazars and a rabbi. The story is told that the righteous king was plagued by a recurring dream in which an angel told him: "Your intentions are desirable to the Creator, but not your deeds." This prompted him to summon a Greek philosopher, a Christian missionary, a Muslim mullah, and a Jewish sage (Yitzhak ha-Sangari) to the Khazarian palace to guide him on the proper religious path. He was dissatisfied with each theologian until he heard what the rabbi had to say. Bulan debated with the rabbi, and finally conceded that Judaism was the one true and correct religion. History records that Bulan and much of the Khazar tribe converted to Judaism. Essays 2 thru 5 of The Kuzari feature lively question-and-answer sessions between the Khazar king and the Jewish rabbi. Topics they discuss include the fundamentals of Judaism, tradition vs. logic, prophetic messages, the afterlife, the land of Israel, the Hebrew language, the benefits of communal prayer, the Sabbath, God's various names, astrology, determinism (fatalism) vs. free will (initiative), and many other subjects. The Kuzari is one of the most revered Jewish philosophical works of all time. According to Rabbi Eliyahu (the "Gaon") of Vilna, The Kuzari is "holy and pure, and the fundamentals of Israel's faith and the Torah are contained within." Translations into English of all five essays of The Kuzari. Information about the Khazars and their king is provided at the start of essays one and two. The complete Hebrew text of The Kuzari (Ibn Tibon version) is included as Appendix F.
An introduction including the history of The Kuzari, a brief history of the Khazar empire, and a biographical sketch of Yehuda HaLevi. Translations of the letters exchanged between Hasdai ibn Shaprut and Khazar King Joseph, a source for the dialog in The Kuzari. In his letter, composed in 954 by his literary secretary, Hasdai asks King Joseph many questions about the Khazar land and people, and explains about life in Spain. Joseph responds by recounting the military victories of the Khazars, including the victory against the Bulgars in the 7th century, and follows by explaining how his ancestor, King Bulan, chose Judaism after engaging in debate with a Byzantine Christian, a Muslim, and a Jewish sage. Joseph also gives a brief description of his kingdom and capital city. The Hasdai letters are included as Appendix E.
Appendices explaining HaLevi's approach to Greek philosophy, living in Israel, the international date line, and Hebrew grammar. Complete with table of contents, general index, index of Judaic sources, and a map of Khazaria. Foreword by Rabbi Yaakov Weinberg, Rosh Yeshiva (Dean) of Yeshivas Ner Israel.